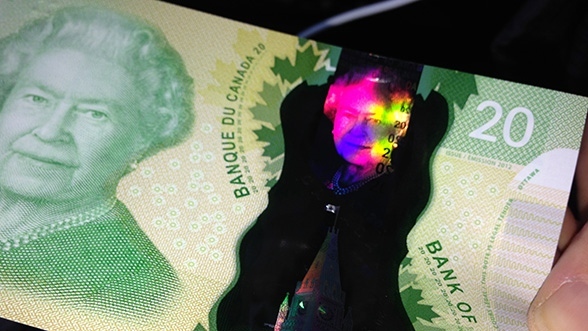 Counterfeit banknotes are a growing problem in Waterloo Region. Staff Sgt. Alison Bevington of the Waterloo Regional Police fraud branch says police have noticed more fake $20 and $100 bills popping up in the region over the last few weeks. A seminar held Friday morning in Cambridge brought together police, the Bank of Canada and local retailers, as bankers shared information on counterfeit money – and tips for detecting it. “We just wanted to make sure that we were doing our due diligence in letting the merchants know that it’s out there,” Bevington says. Vanessa Stergulce, a Bank of Canada analyst, urged retailers to “touch, look at and tilt” each banknote they receive. The recent fake money noticed by police has only involved paper bills – which are on their way out of circulation, as a new set of polymer banknotes has been released in all denominations. Stergulce says the polymer bills have additional security features, including a unique texture and raised ink. “A paper note was very secure in its time, but to stay ahead of counterfeiters and to keep up with technology, we did switch … to give us a more secure banknote,” she says. When it comes to paper money, officials suggest retailers pay attention to a number of security features that may not be present on counterfeit bills. Among them are the numbers and maple leaves on the bill’s metallic stripe changing colour as it’s moved back and forth, raised ink on the large number and the shoulders of the bill’s portrait, a watermark image of the portrait appearing when the bill is held up to light, and the dashes at the back of the note becoming a solid line when held up to light. Counterfeit bills reported to police have come up more often in parts of Waterloo Region close to Highway 401, but Bevington says they can show up anywhere. “Once they’re in circulation, people who don’t know they’re in possession of these counterfeits may also be passing them,” she says. Another sign of trouble, says Bevington, is when a customer tries to pay for something with a disproportionate bill – using a $100 bill on a $2 item, for example. Lynne Mina, manager of the Walking on a Cloud footwear store in the Cambridge Centre mall, says she’s not aware of any counterfeit bills that have come into her store. Still, she says, she felt it was important to attend Friday’s seminar so she could pass on its lessons to her employees. “If we’re not educated about what money we’re taking in, then we may unknowingly be passing it off to our customers,” she says. But ultimately, it’s often not the people who created and first circulated the counterfeit money that find themselves paying for it. 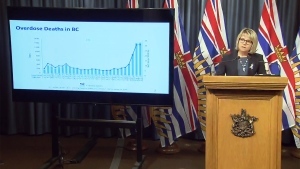 “The last person holding the bill is the person who is at a loss,” says Bevington. It’s estimated that $1.5 million worth of fake Canadian banknotes were in circulation as of the end of 2012. 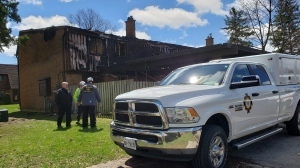 A woman was taken to hospital with minor injuries from an overnight fire.